Prime Minister Narendra Modi will undertake a two-day visit to Gujarat from tomorrow to launch some projects and attend various programmes, including a Textile Summit and a roadshow. This will be Modi's fourth visit this year to his home state where Assembly elections are due by the end of the year. "Will be in Gujarat for a two-day visit starting tomorrow. I will join programmes in Ahmedabad, Rajkot, Modasa and Gandhinagar," the prime minister tweeted. His first programme will be in Sabarmati Ashram tomorrow morning. "I am looking forward to taking part in the centenary celebrations of Sabarmati Ashram," he said. The 2nd programme at Sabarmati Ashram is an event to mark the 150th birth anniversary of Shrimad Rajchandraji, a Guru to Mahatma Gandhi. "I will then travel to Rajkot, where I will join the Samajik Adhikarita Shivir and interact with my Divyang sisters and brothers," Modi added in another tweet. 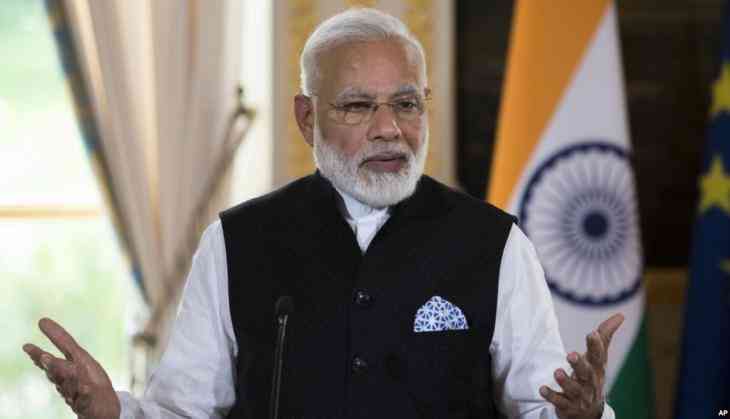 "The prime minister will distribute aid and devices worth Rs 35 crore to over 18,000 divyang people at a grand function at the Race Course ground on June 29. This will be the country's biggest camp in terms of the number of beneficiaries," Gujarat Minister of State for Home, Pradeepsinh Jadeja had said in Ahmedabad yesterday. After that event, Modi would reach Aaji dam on the outskirts of Rajkot city in the evening. The dam will be filled up with water from the Narmada river under the Sauni (Saurashtra Narmada Avataran Irrigation) project. "I shall attend a programme at the Aji Dam, where there will be irrigation & water related initiatives that will be dedicated to the nation," Modi said. "On 30th evening, I shall inaugurate the integrated sports & entertainment 'Arena Project'," Modi added. READ NEXT >> NotInMyName: Thousands in Delhi protest mob lynchings, but will BJP take notice?